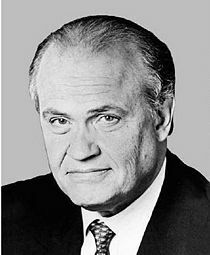 Fred Dalton Thompson (born August 19, 1942) is an American politician, lawyer, and actor. He was a senator from Tennessee until 2002, and then got into acting in film and television. He is married to Jeri Kehn Thompson. He played the role of Arthur Branch, a prosecutor, in the detective television show Law & Order. In 2007 he began seeking the Presidential nomination of the Republican Party for the 2008 election. During the earlier stage of the election he was tapped heavily by traditional conservative wing of the party. His platform championed stronger border enforcement to deter illegal immigration, federalism, and free enterprise. He was endorsed by the prominent conservative magazine, Human Events. After a very late start, Thompson surged in the polls in September 2007. But critics and friends complained of his very slow pace in campaigning, and his support fell by mid-December to about 10%. In January 2008 he withdrew from the race. For a daily update on the polls see . This page was last modified 11:29, 9 June 2009.